"Bag was exactly as described (or even better!). Superb workmanship, and seller went to a lot of trouble to make sure it arrived safely. It was packaged beautifully. Highly recommend this seller." Made in a pebbled, soft beautiful metallic leather, this hobo handbag has lots of beauty and character. 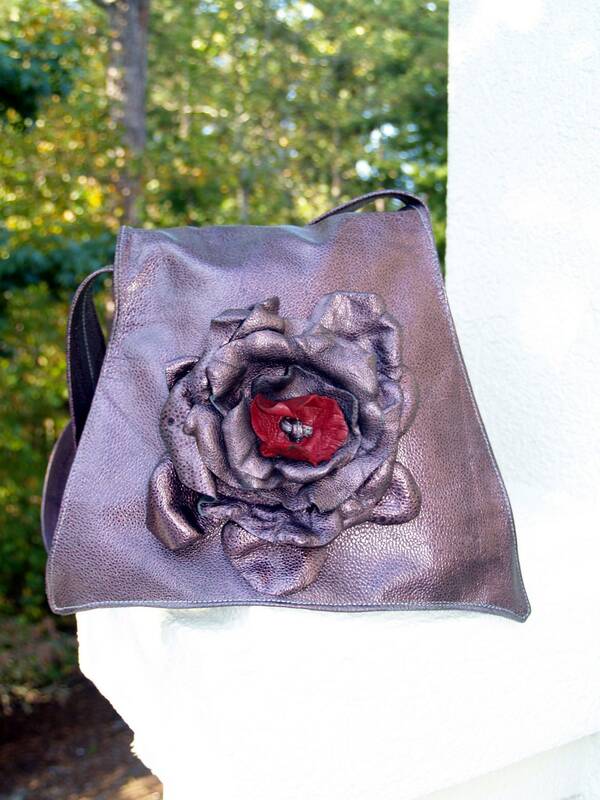 This stunning handbag has a handmade abstract rose on the flap which add character and pizzazz. A unique shape, one of a kind design that's perfect for any occasion. Handbag has three inside pockets. Approximate dimensions are: height is 10", length across the top of the handbag is 9", length across the bottom of the handbag is 12", width at the bottom is 3", drop is 14".